I posted earlier about how AFlavor would be featured on the Today Show. Well it happened, but it was a very brief segment (no pun intended). To view the segment click here. 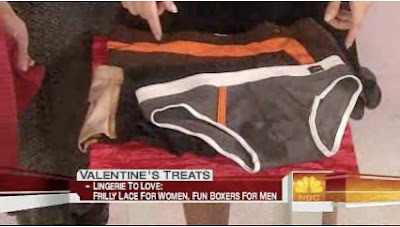 The segment was all about gifts to give for Valentine's Day. Scroll to about 3:58 to get to the point where AFlavor is featured. I played around to figure out to do this. A little tip is: drag the marker vaguely to the point where you want to start and then quickly double click. If you don't want to view the video, but just want to view a summary of the segment click here. It's a very nice write-up, the TV spot was a little awkward (totally the hostess' fault). "...but nothing makes a gal melt like a man who steps up his bedroom ballgame. Help him start with his style, and select a pair of Artificial Flavor's beefed-up briefs. These undergarments were designed by a man and are as stylish as we've ever seen ($25-27.50, aflavor.com). Ginch Gonch will get you in the mood with their trendy take on tighty whities ($25.50-27; ginchgonch.com). Or, opt for Gap's (PRODUCT) RED boxers. Half the profits from these solid-colored shorts go to the Global Fund to help fight AIDS ($20, gap.com)."